Nothing sends a shiver down my spine quite the same way thinking about taxes does. I know many of you feel the same way. Taxes are overwhelming to begin with, and just when we thought we understood what applied to us at least, BAM, changed it. At the end of 2017, the US government passed tax reform, officially known as the Tax Cuts and Jobs Act. We all collectively scratched our heads and wondered how this might impact not only our families but our businesses as well! Since I have basically no clue about taxes, let alone the changes and the new bill, and because I know we all have questions, I reached out to someone who knows better. 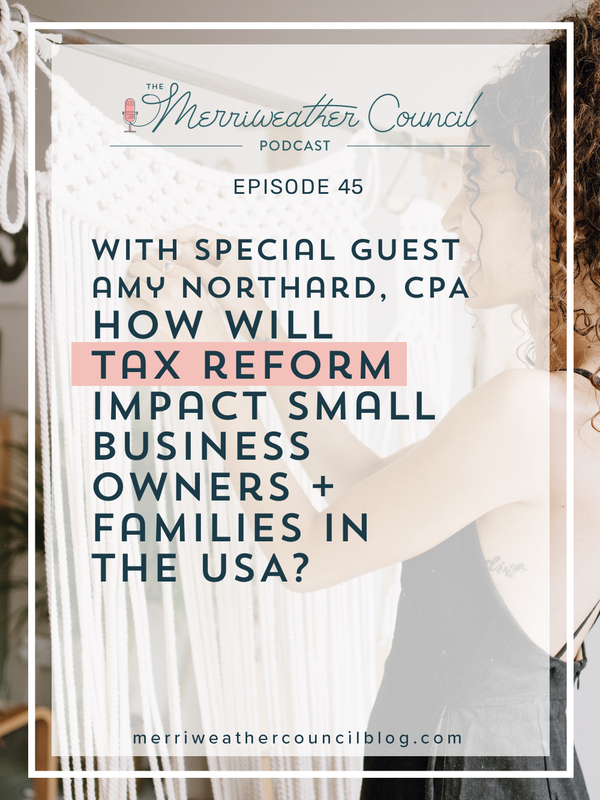 I begged/invited my own CPA, Amy Northard, to be on the podcast to explain some of the key parts of the bill to us! Thankfully she agreed. In this episode I speak to Amy about the tax reform and small businesses like ours! I also asked her how the bill would impact families with children. She also dispelled a massive myth that made it’s way about the internet last year. There are multiple moments of relief in this episode, I hope this helps provide some clarity on what we will be facing when filing our 2018 taxes! For more helpful and humanized tax talk, be sure to check out Amy’s blog and site. She makes all the confusing stuff a little easier to manage.